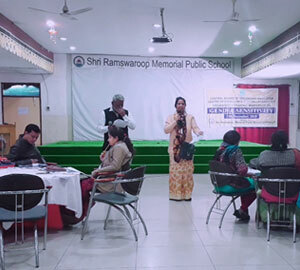 A workshop was conducted by Prithvi Innovations & Lucknow Development Authority at Shri Ramswaroop Memorial Public School on 16th April 2019. The workshop opened with a welcome speech by the Principal, Major Rajesh Ranjit. He appreciated the contributions of Prithvi Innovations towards environment & society and insisted for the valuable inputs in the school. The workshop then progressed on a centralised idea of Donate Don’t Dump. The key person Ms. Anuradha began the workshop with an interactive question answer session and pushed students to ponder over the root cause of reduction of treasured resources from our environment. She highlighted the importance of Panchatatva which have been the essentials since our very own existence. 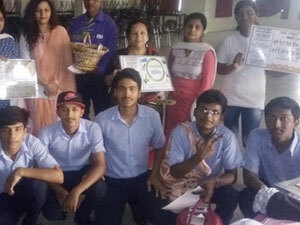 She enlightened the students with the ways that can aid in saving the environment and can easily be applied in our homes and bring a vast change. The latter half of the workshop was utilized in poster making competition and different questions were asked from students which propelled variant thoughts in order to bring harmonious environment. 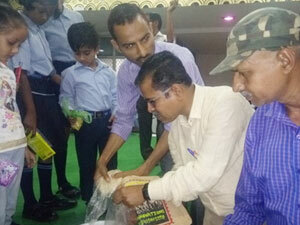 Students also donated Dal and Rice for the needy with a sense to achieve Zero Hunger and will continue to donate clothes, stationery, footwear, school bags etc., which will be distributed on Earth Day. 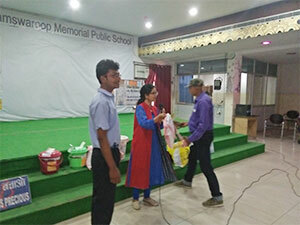 The Prithvi Innovations Team then appreciated the responses by the students and rewarded them eco-friendly prizes. Towards the end of the workshop students seemed to enjoy and they actively spoke about their views and the change that they will bring. The workshop concluded with the thanks note of Head Mistress, Ms. Nandini Lahiri. She admired the ways of Prithvi Innovations and remarked that such efforts will undeniably bring back the earth in green. ‘Swadharma” an organization working towards preserving and nurturing the next generation for a letters future for all. There was a short session, held to make children aware about the safe an unsafe touch by any adult. To make the concept more clear students were shown the video about the safe and unsafe touch. Students were asked to take the pledge that they will always be alert in such situations. Child Line - A Helpline detail was told to students to help themselves and others in need. They provide legal assistance also to one and all. In the end students and staff gave a note of thanks to the organization for such great information and knowledge for their security in life. 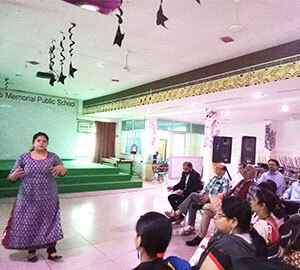 Making it compulsory for all the teachers, the ‘POCSO’ (Protection of Children against Sexual Offences) short session was held at Shri Ramswaroop Memorial Public School on 12th March 2019 in the school auditorium. There were three speakers dealing with different aspects i.e. legal, social and psychological under the banner of POCSO named Smriti Shukla, Amreen and Samrat from Swadharma Human Care foundation. In today’s time, when there is no limit to exposure, no restraint on what children watch and all the more less time to supervise their movements carefully, children are picking up lots of incorrect notions about growing up and are increasingly engaging in unhealthy sexual experimentation. This also puts them at a greater risk for abuse. Ms. Smriti highlighted on the fact that be it a teacher, counsellor, warden, house parent or a parent; at school (in the premises), in the boarding or at home, one certainly comes across children who have witnessed abuse at different points of time. Sexuality education is a broader term that refers to providing information about internal and external body parts, imparting knowledge of proper vocabulary with respect to private body parts, growing up, intimacy, attraction, and relationships. It also involves helping children and individuals to develop right attitude towards sexuality and empowers them to protect self against abuse. Hence, with the objective of empowering concerned teachers, in turn, students and their parents, a POCSO session of interaction with the educators was conducted. 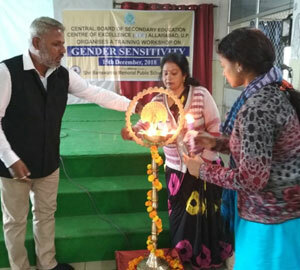 Although the duration was really short as it was an introductory session but the speakers tried to cover various aspects and emphasized on the practical know how about dealing with various themes of sexuality, preventive steps to be undertaken, identifying signs of abuse, key ways of handling it, and knowing The POCSO Act. The session began by showing a short video on child abuse wherein the protagonist was ‘KOMAL’. All the information was imparted through discussions. Further, they promised to come and take up another session guiding the school children. 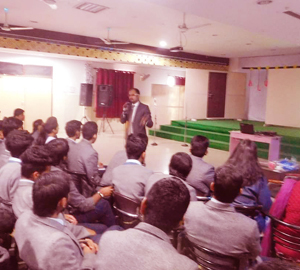 On 15th December'18, a CBSE workshop was scheduled in the premises of SRMPS, Faizabad Road, Lucknow. 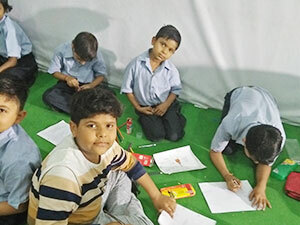 It was a bright and sunny morning when on Saturday, by 8.30, the participants from distinguished schools gathered and started filling registration forms and various other documents required essentially by CBSE w.r.t. the workshop. 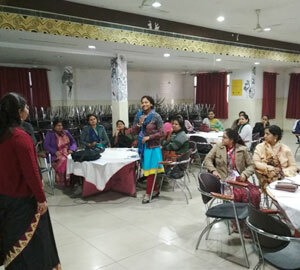 By 9a.m., the resource person for the day, Ms. Adya Shakti Rai arrived and all reached to the SRMPS auditorium where the workshop began and continued for good 8 hours including 3 breaks. The entire workshop was divided into 2 sessions-pre-lunch and post lunch. 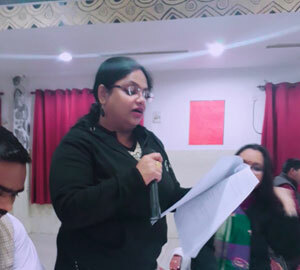 The first half of the workshop was dealt by Ms. Adya Shakti wherein she shared about herself and informed the participants about her childhood, schooling, higher studies and her varied experiences regarding Gender Sensitivity. 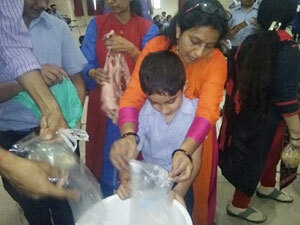 Variety of handouts were provided which added more life to the session as no. Of activities inclusive of varied group activities were to be done. Ms. Adya emphasized on the fact that gender Sensitivity is nothing but our mindsets which is set as per the society we live in. She highlighted that being teachers, we play a vital role in spreading awareness regarding this critical issue as we deal with both the genders in terms of our students and therefore, ought not to discriminate between girl and boy student. The duties, responsibilities should be equally assigned realizing the capacity and worth of the child rather than considering gender as a decision factor. She discussed about gender equality, equity, power with, power in and various other aspects covering the topic of gender Sensitivity. The Principal of SRMPS, Major Rajesh Ranjit took the second half of the session in the workshop and excellently came to the completion of the workshop. He added more spice to the session by putting variety of questions as food for thought for all present in the room. 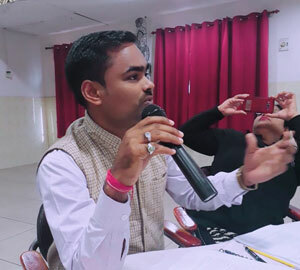 He used his wit and wisdom by twisting the questions in such a manner that many a times, participants were found debating and hence, thoroughly involved which successfully sorted out the purpose of the scheduled workshop. 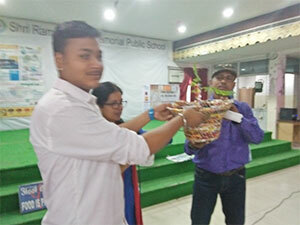 While leaving, the resource person for the day, Ms. Adya Shakti Rai was handed over a gift by Principal Major Rajesh Ranjit as a token of memory. This, though the day was hectic but was sensitively utilized for understanding the core concept of gender sensitivity and its role in shaping the society and making it a better place to live. The students of SRMPS Senior section, began their day on the 27th of January 2017 with a stimulating workshop on Memory Enhancement by Mr. Tushar Chetwani, a renowned memory trainer who holds many world records in the field. Mr. Chetwani is also the author of the National Bestseller ‘Memory Infinite’. The workshop was organized to help the students increase their potential to memorize things more effectively and efficiently. 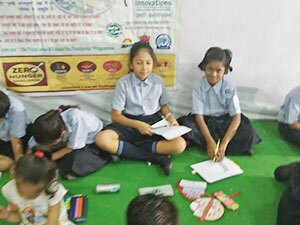 Various problems faced by students during exams were discussed and the aim of the workshop was clarified to the students, which was to fortify the endeavours of students in learning, by opening new vistas of memory in the students’ brains which would help them to memorize their syllabus easily. The second day of the workshop on 28th January 2017 started with a lot of excitement among students. The fascinated students were eagerly waiting to be introduced to the different applicable ways of memory enhancement. 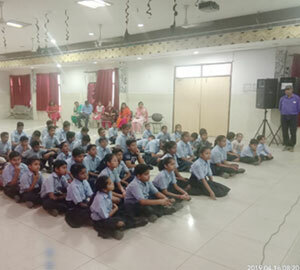 Mr. Tushar asked the students to learn some words which were displayed on the screen and later helped them learn the pattern to remember the sequence. 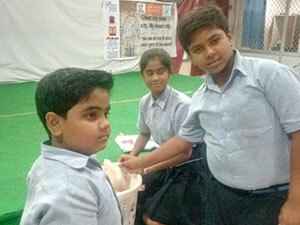 Mr. Tushar applauded their efforts when soon the students performed as expected. Students were told about the results of positive thought process. On the third day of the workshop on 30th January 2017, the students were extremely curious to learn more tricks and techniques to enhance their learning of different subjects. Students were taught how to find out the day of any date from the past. The 4th and the last day of the workshop on 31st January 2017 witnessed the students applying all that they had learnt in the last three days. 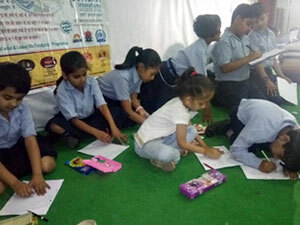 The students excitedly completed all tasks as expected. The involvement of the students was commendable. 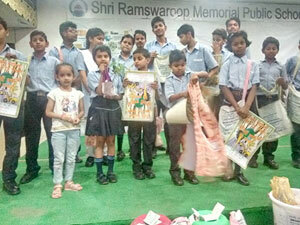 Each student was provided with a CD and Information material regarding memory enhancement programme. 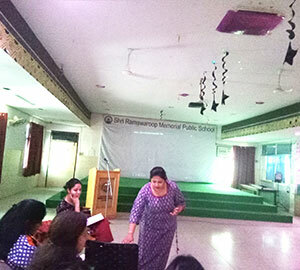 On 26th & 27th of March 2010, the faculty members of SRMPS attended a wonderful and eye opening Orientation Program. 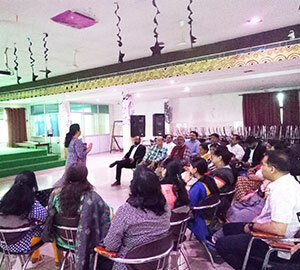 The two days program was conducted by Mr. & Mrs. Akshay Wal. 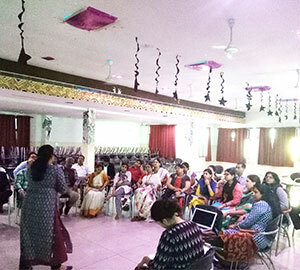 The Orientation Program’s main motive was the personality development of teachers. How should one start afresh relationship? Discussed the reasons for failure of team. Time management – how to handle urgent and important work. Discussed about character, competence and commitment. Discussed the reasons for doing the work single handed. We hope that this orientation program is going to bring a revolution in our day to day activities so that we can improve the teaching, and successfully handle the students. We understood the importance of communication in developing better inter personal relationship. We realized the importance of team work, conflict management and time management. 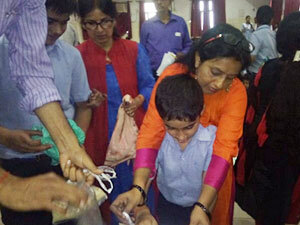 An Art and Craft workshop on Clay modeling was held in the school on Saturday i.e.17th April. The children of the primary section got an opportunity to try their hands at dough modeling with the help of colorful dough that came in attractive plastic jars. The teacher showed them how to make a Teddy bear but the children surprised her with more creative ideas of their own and making things like mobile phones, python, dolls, kettle, smiley face, dog and telephones. Class K.G. enjoyed the most when they pressed the modules against the dough and the figure of different animals popped out. Next was the turn of paints which gave a 3 D effect to the cards made by the children. The embossed design was very attractive and easy to make by just squeezing the plastic tubes which left an impression on paper which looked like a piece of modern art. 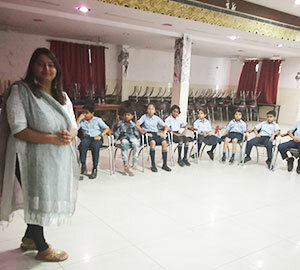 The workshop was enthusiastically attended by teachers and students alike and it helped the teachers to get an insight into the different ways the children can show their creativity. Career! A word that puts number of students in a dilemma. The first thought that comes to mind is what to do after XII? How to build our career? How to get a good job? This state of confusion is something most youngsters experience. 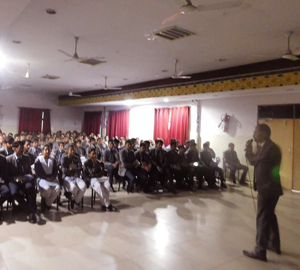 Our school arranged a workshop on career counseling on 3rd April,2010 by Career Launcher, Lucknow, to give us some information about different job opportunities, for students from different streams like Commerce Science etc. Our interactive session started at 11:00 clock by a professional counselor Mr. Rajiv Agarwal, who belonged to Career Launcher. 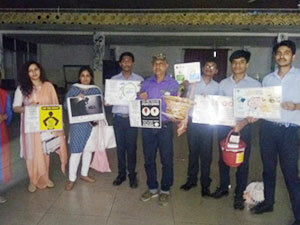 The workshop was attended by Principal Ma’am, Vice – Principal Sir and students of classes X and XII. It started with a simple question regarding how many of us had decided our career option and only, 2% had clear goals out of a total of 50 students present. The workshop proceeded with the presentation of various slides about different courses like, “Bachelor of Business Administration (BBA), LAW”. “Hotel Management”; “Engineering”. These slides gave the information about various new options and about how to prepare and proceed in the direction of achieving our goals. The main points covered by them were the type of preparation needed for entrance exams; best college placements; packages offered; courses; study materials etc. Clarity of purpose and goal was stressed most in the whole session. We should be sincere enough towards our studies and concentrate on the basics. Good reading habits and general awareness were stressed upon. “Time Management” was also an important topic that was widely discussed. At the end of the workshop, we had a one – to – one counseling session, where students sorted out their individual problems. We got a lot of information from this workshop and it boosted the confidence level of the students. Music plays a very important role in our life; if we are angry and we listen to music it changes our mood. So to relax us in the activity period this Saturday we had a music workshop conducted in our school by ‘Jalota Music Academy’. We were very excited to be a part of this workshop as we were all ready to soothe our ears by listening to some foot tapping music. 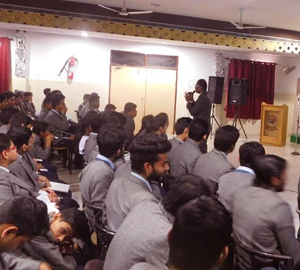 The workshop was conducted by Mr. Sachin Singh Chauhan and his band mates and it took place in our school auditorium. The workshop was conducted on the 8 th of May. It was a very melodious workshop. They sung various songs from various genres like Papa kehte hain, All is well, Haan tu hai and more. They also told us about the importance of music and the soothing effect it has on the minds of all age groups. The students enjoyed themselves to the core. Some students from our school like Akshay Singh and Sarthak Rastogi also added to the musical workshop. Our music teacher Ekta ma’am also sang various tracks. All the students were spell bound and then after spending some time with the geniuses of music finally the workshop came to an end. It was a fun filled experience for all the students and we wish to have more of such melodious workshops in school. These days workshop are very common. In our school also, workshops take place very frequently. Recently we had a workshop on Radio Jockeying which was conducted by the RJ of Radio Mirchi (98.3) Mr. Arjit. He also added many fun activities in it which we enjoyed a lot. He told us about the importance of radio in our life. He explained that radio directly makes its place in our mind. What the RJ’s say we directly make an image of it in our mind. He also explained very minute things which we should keep in our mind every time. He told us that we should avoid saying common things which other people also say about themselves. We should always tell interesting things which other people would remember for a long period of time. He also told the value of communication skills in our life. Then he discussed the things which we should keep in mind while giving any competitive examination or an interview. He suggested that we should speak about those things only about which we have detailed knowledge and can answer any sort of questions on that topic. We also performed an on the spot skit which we prepared in a given time i.e. 20 minutes. We also modified the scenes of movies which were chosen by us. All this work was done in groups which taught us team – spirit. At last, I would like to say that all it was a very informative as well as fun filled one week workshop. If you think that by winning lottery or by doing a job of a million dollar will leave you feeling contented for the rest of your life, think again, money can buy you only a handful of happiness but by working for the needy and backward sections of the society, for those who are deprived of basic necessities will definitely give you on awesome feeling of mental satisfaction. On 3rd July 2010 a work shop was conducted by Times, which was addressed by Mr. Surya Pratap Singh who told us how to excel in and solve the problems in whatever sphere we choose. He also told us how we can work for the welfare of the common people, how we should choose a profession which not only gives us an opportunity to make money but also to help the people in our society. He also told us how we can achieve objectives by just working a little extra. The main goal and objective of the session was to draw our attention towards those in genuine need of help but are ignored by policemen and political leaders. 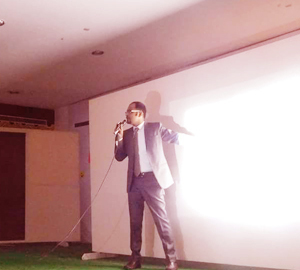 His oratory skills were good enough to encourage us for supporting them and changing the planet with our efforts. As career plays an important role in our life. After Class Xth students become more concerned about their career, as they have to decide their streams. The days are gone when people think about becoming doctors and engineers only. Now students have many options. They can opt for designing, architecture, civil services etc. Law is also a good profession with excellent scope. Now days, a lawyer could fetch more money and reputation than a doctor or an engineer. Those who want to become lawyers have to qualify CLAT. CLAT stands for Common Law Admission Test. On Saturday (10th July, 2010) afternoon we were informed about a career counseling. All the students attended the workshop and I was surprised to know about the opportunities, in law which was available for us. It is high time we started thinking about the welfare of our own society. Only one exam with 5 subjects is conducted in CLAT. Since, very few students participate in this examination as compared to IIT, so placement is higher with fruitful salary. The five subjects which are tested in the exam are – English, Math’s, General Knowledge, Reasoning and logical questions. We should not wait for others. Let’s join hands to eradicate the corruption and take a stand to make our society a better place to live by motivating the maximum people we come in touch with to become law abiding citizens .